An association is able to move members from one club to another using the ‘Edit Clubs‘ function. This option is not available to clubs. 1. From the Association level of Membership, click on Members in the menu and select List Members. 3. Click on the View Record button next to the name of the member you want to move to another club. 4. Click on Member History in the menu and select Clubs. 5. The club history of the member will appear. In the below example, the player belongs to Aberfeldie. To move the player into another club, click on Edit Clubs. 6. A list of clubs within the association will appear. In the below example, it can be seen that the player is currently active within Aberfeldie for the 2014 season. The season that appears for the Edit clubs screen (in the below example, 2014), is the 'Current Season' which is set by the association. 7. 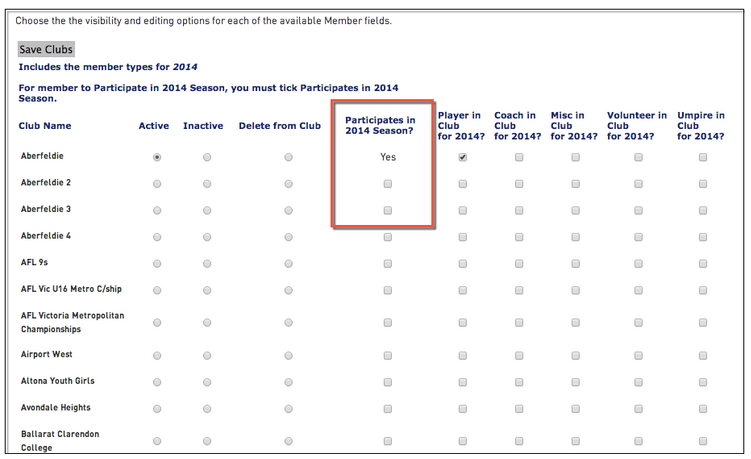 Move the member out of their current club by clicking the 'inactive' radio button next to that club. This will remove their 'active' status in that club. 8. Alternately, if the member will be active in both clubs, leave the 'active' radio button selected for their current club. Move the member into their new club by clicking the 'active' radio button next to their new club. 9. You also have the option of 'registering' the member into the Current Season by ticking the 'Participates in Current Season?' check box. 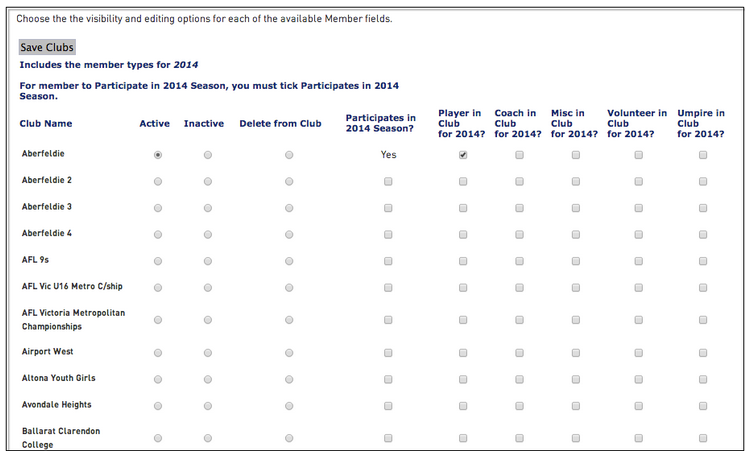 You may then select whether the member is a player, coach or official in the club for the Current Season using the check boxes provided. 10. An association can also delete a member from a club. Select 'Delete from Club' to completely remove the member's record from that club. Note: Before you can select whether the member is a player, coach or official in the Current Season, you must tick the 'Participates in Current Season' check box. 11. Click on Save Clubs to update the member's club information. 12. A message will appear confirming that the member's club information has been changed. Note: Clubs in which the member is inactive will have ‘read-only‘ access to the member‘s details (I.e. They can see the member‘s record but can only edit their basic contact details. When they view the member's record, the club does not have access to all of the menu options available for active members. The only menu item available is 'Dashboard'. The member also appears as 'Not Registered'.